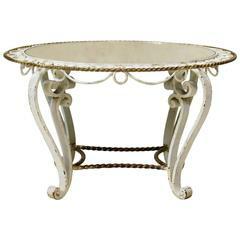 Attributed to designer Robert Merceris, this glamorous French Art Deco coffee or side table has a black and gold forged iron base with scrolls and gilded acanthus leaf motifs. The marble top has gray, reddish brown and white tones. Marble is 24 and 7/8" in diameter. Couple of minor chips on marble at edges. Minor rust on iron at feet. 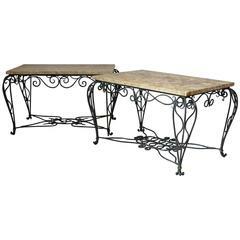 One-of-a-kind Folk Art coffee table, with a twisted and hammered wrought iron base and a green marble top, in the Art Deco taste. Top is a recent facture by Cesare Arduini, United States, 2017. 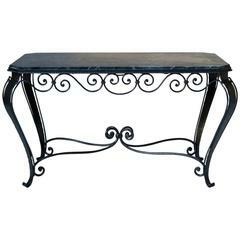 Elegant hammered and wrought iron coffee table raised on cabriole legs, with a curlicue apron. Dark green marble-top veined with black and white. 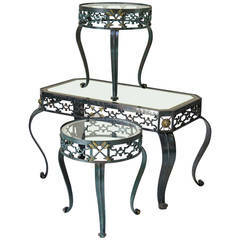 Pretty iron coffee table, raised on cabriole legs, with a scallop-edged églomisé mirror top. The base is painted in original cream color, with gold accents.